This is a300 metre long native species hedge between the lake and the playing fields on Astral Park Plus, overlooking open countryside on the eastern edge of Leighton Buzzard. 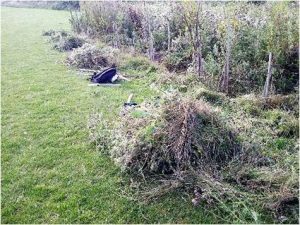 In summer 2014 Leighton Linslade Town Council approached South Bedfordshire Friends of the Earth to ask them to work with them on planting a native hedge that was good for wildlife and which would also provide a wind break for those playing and watching football. 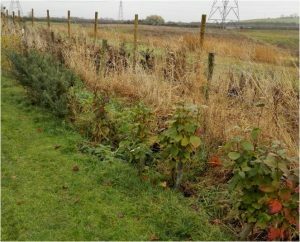 South Bedfordshire Friends of the Earth had previous experience of planting native shrubs in the adjacent field in 2008 by the willow plantation, and they also took advice from the Greensand Trust who had recently planted a hedge with the community on the RAF Stanbridge site. The soil is very poor and hard to dig so it was agreed that LLTC would dig a big trench and fill it with compost. It was understood that any planting on this type of clay soil takes time to establish; South Beds Friends of the Earth had previous experience of doing this at Knaves Hill. The best value supplier of hedging was the Community Tree Trust based at Clophill, Bedfordshire, and their plants had the advantage of being grown from native Bedfordshire seed. Some large shrubs (@ 1.5 metres tall) of willow, alder, hornbeam, buckthorn and hawthorn were planted in order to create a wind break as soon as possible, followed by some medium-sized shrubs in blocks, with some small whips at the entrance. One of our aims was to create blocks of different species so that when the hedge had become established it would be a great educational tool for the local school and local community, so that people could learn to recognise their native species. The hedge was planted in November 2014 with members of the local community. We planted 27 native species, three apple trees and one plum tree at the entrance. We also planted an area with ivy and honeysuckle as these are both very important for bees and butterflies. We also planted hawthorn, blackthorn, buckthorn, beech, holly, broom, oak, ash, buddleia, alder, willow, hornbeam, guelder rose, wayfaring tree, dog rose, field rose, dogwood, field maple, hazel, birch, alder buckthorn, crab apple, wild pear, elder, and wych elm. In early 2015 the hedge flooded due to problems with drainage in Astral Park, and a lot of shrubs were lost. We worked with the town council and helped to dig some drainage. However , well over half of the hedge is now growing well. The holly, beech, buddleia and elm suffered a lot from the flooding, but surprisingly the broom and gorse are growing well, even thought they usually like dry conditions. The wayfaring tree and wild rose have done well, and it looks as though we will achieve our aim of providing well over twenty native varieties of hedgerow shrubs and trees to be used as an educational tool as well supporting wildlife. In addition, a lot of the taller trees are growing well and creating the windbreaks we wanted. In 2015 with local residents we planted ten hornbeam trees that were donated by the Community Tree Trust. The main maintenance workload has been weeding, as the thistles can take over and smother the young shrubs. We have held a number of work parties winvolving volunteers from South Beds Friends of the Earth and local residents, and on one occasion we had an evening session with 22 Young Explorers who took part in a 3-hour weeding session. Piles of weeds after a successful work session!